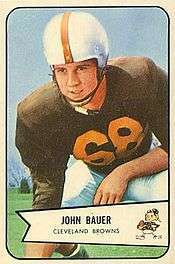 John Richard Bauer (born March 11, 1932) is a former American football guard and tackle who played for the National Football League's (NFL) New York Giants. Born in Benton, Illinois, Bauer attended the University of Illinois, where he played for the school's football team from 1951 to 1953. In the first round of the 1954 NFL Draft, the Cleveland Browns chose him with the 12th overall pick. In August 1954, Bauer was traded to the Green Bay Packers as part of a six-player transaction. A month later, the Giants acquired Bauer from the Packers in another trade. Bauer played in two games for the Giants during the 1954 NFL season as a backup. He went into the Army and returned to the Giants in 1957, but left the team before the start of the season. 1 2 3 "John Bauer". Pro Football Reference. Retrieved June 29, 2011. ↑ "All-Time Letterwinners". University of Illinois. Retrieved June 29, 2011. ↑ "Browns Swap Quarterbacks". Eugene Register-Guard. Associated Press. August 7, 1954. Retrieved June 29, 2011. ↑ "Giants Get Bauer". The Windsor Daily Star. Associated Press. September 21, 1954. Retrieved June 29, 2011. ↑ "Nary Replacement For Giants' Grier?". The Miami News. Associated Press. July 28, 1957. Retrieved June 29, 2011. This article is issued from Wikipedia - version of the 8/8/2016. The text is available under the Creative Commons Attribution/Share Alike but additional terms may apply for the media files.